Just 5 km away from Sciacca, an art village famour for its ceramics, its food, its sea and its Spa, Villa Muciarè is located in the beach hamlet of San Giorgio. It is an independent villa that has been recently renovated and finely furnished according to the typical Mediterranean style, marked by Arabian & Norman features. Villa Muciarè is made up of 3 comfortable bedrooms: 2 double bedrooms and a twin/double one. Each one has romantic and relaxing tones; their position allow its guests to live their holiday with privacy. On request, it is possible to add 1 single bed in one of the double bedrooms. Moreover all bedrooms are provided with air conditioning and ceiling fans, linens and bedspreads; their windows are protected by mosquito nets. The two bathrooms, close to the bedrooms, are furnished with hair dryer and bath towels, 1 set per person. The big kitchen is equipped with dishes, utensils and everything you need. The comfortable living area has LED TV, DVD player, free WiFi, TV sat, sofa and dining area. The living area is linked with the wide verandas, divided into a covered dining area, a sofa corner for your relaxing moments and a solarium area with sea view, where you will find deck-chairs and a outer shower with hot water. 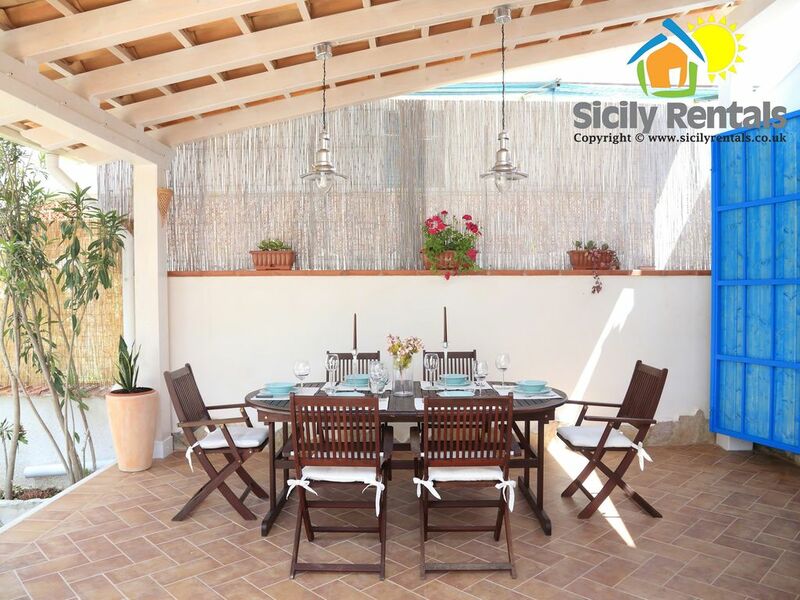 The outer part is also furnished with BBQ area, where spending pleasent culinary moments cooking fresh fish from Sciacca together with your family and your friends. Villa Muciarè is the ideal place for family or groups of friends who want to spend their unforgettable holidays by the sea, admiring stunning sunsets, walking along the shore of fine white sand, enjoying the quietness of this romantic hamlet and swimming into the blue Sicilian sea. All our guests are provided with beach towels. Moreover the owner offers 1 sun-umbrella and 2 deck-chairs to bring to the beach. The villa has a very good position from which starting a tour of our beautiful cities and of the famous archaeological sites of “Valley of Temples”, Selinunte, Segesta, Eraclea Minoa. Moreover you can also easily reach natural and beautiful places such as Scala dei Turchi, Torre Salsa, the natural Reserve of Foce del Fiume Platani, Erice. For a pleasant daily trip we also suggest to visit Egadi Islands,reachable in about 1 hour. Our guests are welcomed with a basket full of Sicilian typical products. Nicely decorated villa, close to the beach. It was a amazing stay, we had only one problem - the wi-fi didn't work. This villa is exactly like the photos , clean, spacious and fully equipped with everything you could need. You can see the sea from the gates and the beach is large and a good spot to relax. The owner is very welcoming, accommodating and helpful. Un grazie di cuore ai proprietari Marianna e Daniele!! Cosa dire di Villa Muciarè? Molto bella la spiaggia di sabbia che dista 50mt dalla casa. Tra i confort principali, molto utile il wifi free presente nella villa e il ricco cesto di benvenuto che abbiamo trovato al nostro arrivo. Il posto è ideale anche per soggiorni rilassanti, la borgata sul mare dove è ubicata la villa è veramente tranquilla. The villa was fully equipped, clean and so close to the beach. We were looked after by Daniele and would certainly stay here again. I would maybe arrive a few weeks later when a few more shops and restaurants were open in San Giorgio as we had to drive to get supplies, but, this was only minor and once we did our shop in Sciacca, it was a pleasure to cook in the kitchen and eat out in the patio area. We had such a wonderful stay in this vila, very beautiful house, beach, restaurants - Sicilian culture in its most autentic version. We just loved it and we recommend everyone else to visit this beautiful place. The villa will offer you this and a lot more. You will experience the emotion of a special vacation combing the typical rustic quietness, magic landscapes, sea and natural paradises but also marvellous cultural routes. By tradition, Peppe Nappa, the mask symbol of Sciacca Carnival, opens the celebrations by giving out sweets, sausages and wine to everybody and closes them with its stake. Sciacca boasts a substantial production of grapes, cereals, olives, and citrus fruits. The town also has conspicuous fishing resources. The handicraft activity is especially characterized by the production of artistic ceramics and wooden objects. In order to book the house the payment of 25% is requested as reservation deposit by bank transfer or credit card. The balance, together with the security deposit, will due the day of the arrival. Please note that the weekly price includes the final cleaning fee, that has to be paid once per booking (not weekly). Per prenotare la casa è richiesto il versamento del 25% della tariffa di affitto tramite bonifico bancario o carta di credito. Il saldo, insieme al deposito cauzionale, sarà versato il giorno dell'arrivo. N.B. I prezzi settimanali mostrati nel sito includono le spese di pulizie finali, tariffa unica per la durata del soggiorno e non settimanale.